Home > Russia, Technology	> Why Do These Breathtaking Russian Images of Earth Look So Different from NASA’s? 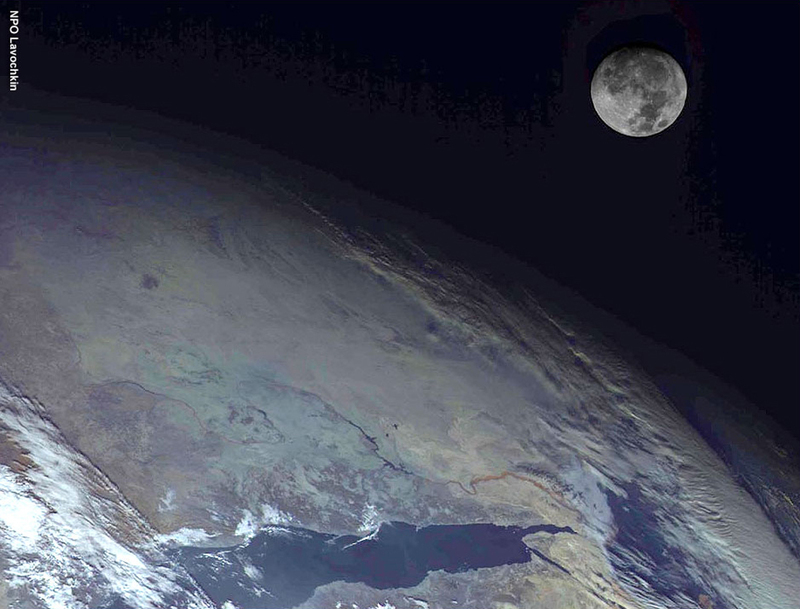 Why Do These Breathtaking Russian Images of Earth Look So Different from NASA’s? While this morning’s orbital image of Mercury is historic, these two images are the ones that have truly left me in complete awe today. Even more so than the most accurate, highest resolution view of Earth to date. But unlike Blue Marble, these images are not by NASA. In fact, they look a lot different from NASA’s Earth imagery. Much better and crisper, some may say. But are they really better? Are they more accurate? NASA has explained to us why they look so different compared to their own. It was taken by a Russian spacecraft, a new weather satellite called Elektro-L. It’s now orbiting Earth on a geostationary orbit 36,000 kilometers above the equator, after being launched on January 20 from the Baikonur Cosmodrome, on board a Zenit rocket. This is the first major spacecraft fully developed in post-Soviet Russia, developed by NPO Lavochkin for the Russian Federal Space Agency. This is a major step in the country’s aerospace industry, after two decades of trouble developing anything new and living from the past glories of the Soviet system (which are great on their own right). Elektro-L is a 1620-kilogram beast, consuming 700W from its 1.7kW solar panels. Its design is modular, with a service part called Navigator and a payload part that contains the spacecraft weather monitoring equipment. A future satellite, the space telescope Spektr-R, will use the same base module with a different payload. In the case of Elektro-L, the payload is a 1-kilometer-per-pixel resolution camera for the visible spectrum and a 4-kilometer-per-pixel one for infrared. The spacecraft sends images every 30 minutes using a 2.56 to 16.36 Mbits per second connection with ground control. In case of emergency, the agency says, they can throttle up the frequency to 10 minutes per image. Why do they look different from NASA’s? But all this technological terror is nothing compared to the beauty of these images. 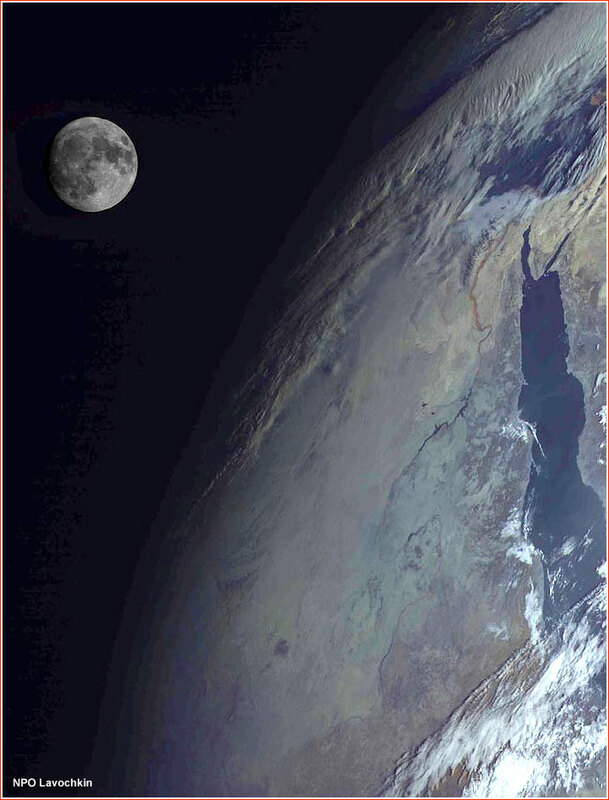 The top image shows the Moon over the Red Sea region. The one next to these lines is an incredibly detailed view of our planet, showing Africa, Arabia and India. Elektro-L is a Russian Satellite similar to GOES (the satellites that provide the cloud image loops shown on the news every night). The images posted by Gizmodo are a combination of visible and near-infrared wavelengths, so they show the Earth in a way not visible to human eyes (vegetation looks red, for example). They’re not any better or worse than NASA images, but they show different things. The Elektro-L is similar to their GOES satellites. “It’s a geostationary weather satellite orbiting above the equator at ~54˚ East” says Robert, “the US has two similar operational geostationary satellites over the east and west coasts, EUMETSAT has one over Europe and one over the Indian Ocean, Japan has one over the far western Pacific.” The difference between them is that Elektro-L uses three bands in reflected light—red and two near infrared bands—while NASA’s GOES doesn’t have the near-infrared. The 3 reflected sunlight bands can simulate a conventional red-green-blue color picture. The near infrared channel is a vegetation indicator, since plants reflect near-ir as well as green. You can learn more about the basic characteristics of Elektro-L’s ten-channel imager, the Multichannel Scanning Unit (MSU), here. Which images are more accurate? Blue Marble uses true color images, combining red, green and blue into a global composite and rendered in a 3D program. It’s actually what the eye can see. The Russian satellite, however, is presenting a different view. It may feel more realistic, but it’s not. I wouldn’t really say one approach is more accurate than another: Viewing the Earth in different wavelengths gives scientists different information. 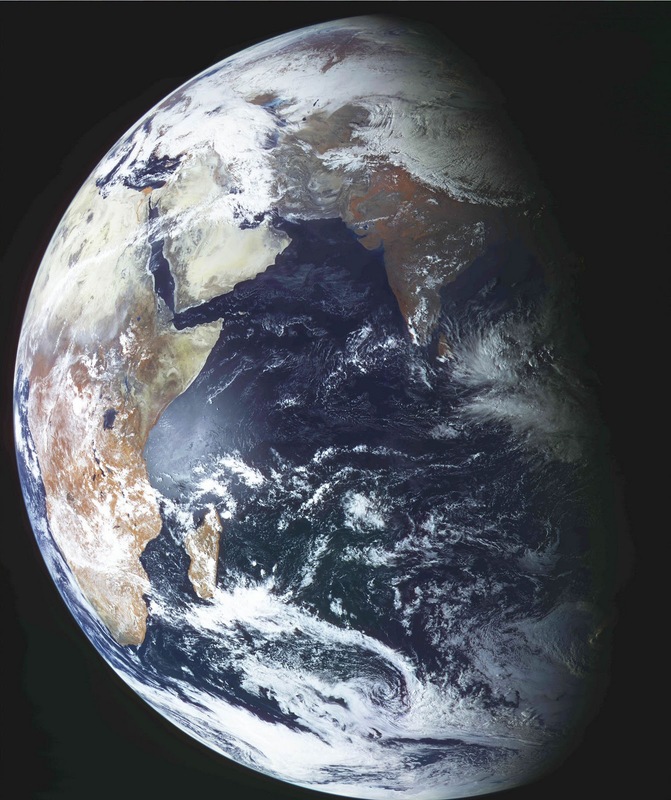 Since the Blue Marble is true color, images based on it are easier for non-experts to interpret than false-color images. However, it’s composed of many days of data, so won’t be as detailed as single images at the same resolution, and shows a fixed point in time. It does show the whole globe, while Elektro-L will only show the hemisphere it’s facing.